I lived in Florida in the US for over 23 years and became extremely familiar with Brown Pelicans and the American White Pelican. Brown pelicans nested and fed all along the coast of Florida and when I lived there from 1975 to 1997 their populations were recovering following the ban of the pesticide DDT. DDT caused the shells of pelicans as well as many raptors such bald eagles and peregrine falcons, to thin. The parent would crush the eggs when they tried to incubate them. Large numbers of the larger American white pelicans winter in Florida when they come south from their breeding areas in north-central US and central Canada. The brown pelican feeds by plunge-diving from a dozen or more feet above the water. The white pelican feeds by plunging its head into the water while often swimming in a cooperative line with many other individuals. Both use their incredible bills with the large extendable pouches to capture fish in a manner similar to a fisherman using a net that he drags through the water. 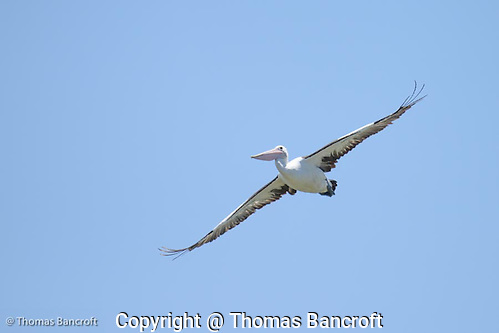 When I planned my recent trip to Australia, one of the birds I hoped to see was the Australian pelican. This bird has the longest bill of any living bird in the world. Some males can have bills up to 20 inches from the tip to the gape. Females have shorter bills. Males often weigh 8 kg or more, which translates into close to 20 lbs, and they can fly superbly. 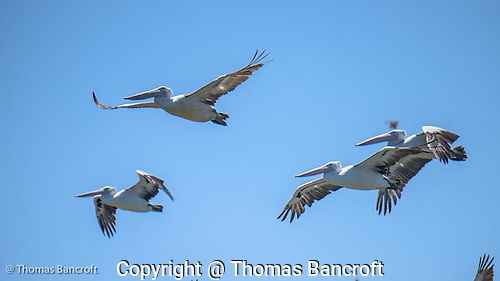 I first heard stories of Australian pelicans in the late 1970s when large rains in interior Australia flooded many of the landlocked lakes such as Lake Eyre. 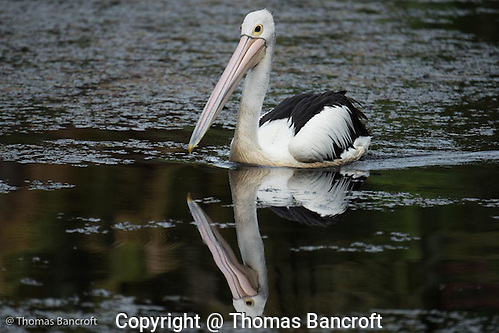 Pelicans and other wetland birds moved in large numbers into interior Australia to exploit the “boom” cycle of aquatic organisms that multiply and breed in these periodic floods. Lakes like Lake Eyre have no outflow. They fill only periodically when heavy rains occur within their watershed. In many if not most years, these lakes have little to no water and pelicans avoid them, staying instead along the coast. 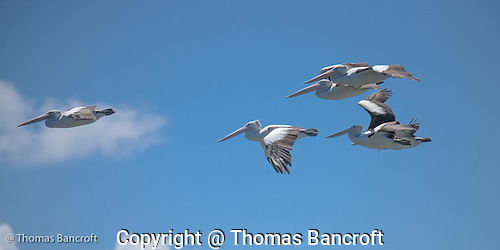 In 1990, Lake Eyre and the Australian Pelican again made international news when upwards of 40,000 pairs attempted to nest at the Lake. I would not be in Australia at the right time to see these large breeding colonies, but maybe I could still see this bird. Paul Hackett of Melbourne Birding Tours agreed to take me to the Werribee Wetlands just southwest of Melbourne to see what wetland birds we might find. As he picked me up at my lodging near Melbourne, he thought we might have a good chance of seeing Australian pelicans at the wetlands. The Werribee wetlands are a complex system of lagoons, wetlands, small lakes and coastal habitat. Hundreds of thousands of ducks, shorebirds, terns, gulls, cormorants and swans frequent this place. BirdLife International, a network of conservation groups across the globe, has this site listed as a “globally significant Important Bird Area.” The concentration of wetland birds and the fact that the site supports individuals of the endangered orange-bellied parrot warrants that this site receives international recognition. The site stretches from the mouth of the Werribee River to the town of Geelong in Victoria Australia. I worked on wading bird conservation issues in the Everglades of South Florida and was excited about what we might see in these wetlands. Wetlands will always have a special place in my heart. We arrived just before noon after having spent the morning in the wet forests north of Melbourne. In Werribee wetlands, we found numerous ducks, swans, shorebirds, gulls and cormorants, and we could easily observe them from the car as we drove the network of dikes and dirt roads. I saw a few pelicans in the distance but none very close. About 2:30 PM we rounded a corner to find a large flock of birds including a few thousand Australian shelducks roosting on the far side of a small lagoon. The flock included a hundred or more pelicans. The birds immediately, unfortunately, took flight. The pelicans rose quickly on strong, steady wing beats and then began to circle and glided right down by, over, and in front of us to resettle in the lagoon. I felt like I could reach up and touch one of them as they passed by. The wings stretching 7.5 to 8.5 feet (2.3-2.6 m) created large moving shadows across the landscape. Several groups came close as they drifted back to the water and I could see the details of their black flight feathers and white wing coverts and their enormous pale pink bills. I couldn’t have asked for a better look. A week later, I was birding with Jonathan Munro of Wildwatch Australia in northern Queensland. We stopped at Centenary Lakes Park near Cairns late one afternoon and discovered a single Australia pelican paddling across the pond. The dull pink bill extended down toward the waterline to a yellowish hook at the tip. The yellow ring of bare skin around its jet black eye made it look like a pirate and a small chuckle escaped me. The fine white covert feathers on its wing hung down over the black flight feathers like a scarf on a beautiful woman. As it drifted through an open patch of water, the water created a perfect reflection of the bird. We stood and watched it glide elegantly along the water, making a small ripple behind it. As we strolled along the lakes edge, I realized that while we watched the pelican, I had been shifting my weight back and forth from each leg and my mouth had become dry. This truly is a magnificent bird and I was so lucky to have seen it so well during my trip. Have you ever watched a large bird fly and wonder what it must be like to fly?